MOVING SUPPLIES, BOXES,TAPE,BUBBLE WRAP ETC. 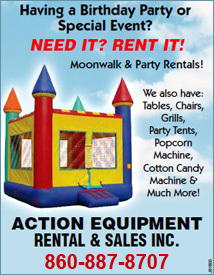 At Action Equipment Rental and Sales we specialize in providing equipment and party supplies for homeowners and contractors alike. With a full line of contracting equipment, we can cater to just about any construction need. And with a full line of party supplies, including moonwalk rentals and party tents we can serve just about any party need. Contact us today to receive a free estimate and consultation.